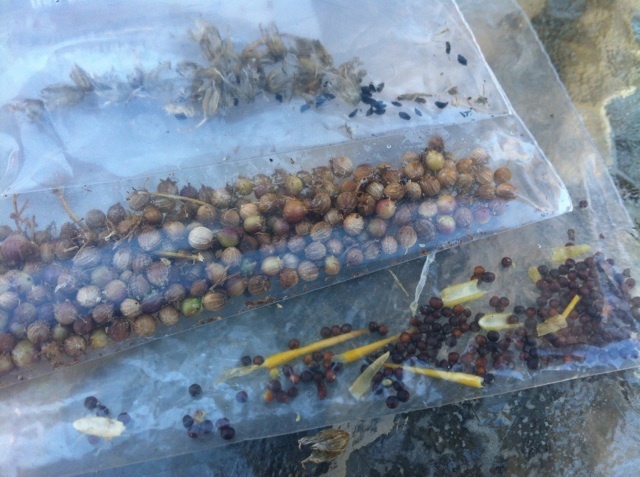 Queen Composter shares the whys and hows of seed saving. As the summer begins to wind down, I am taking plants out of my garden that are finished to make room for my winter garden. However, I will be leaving several plants in to let them bolt, or go to seed, to save for next year’s garden. This will leave my garden looking somewhat brown and shaggy in parts, but that is a compromise I am willing to make to save seeds for next year. 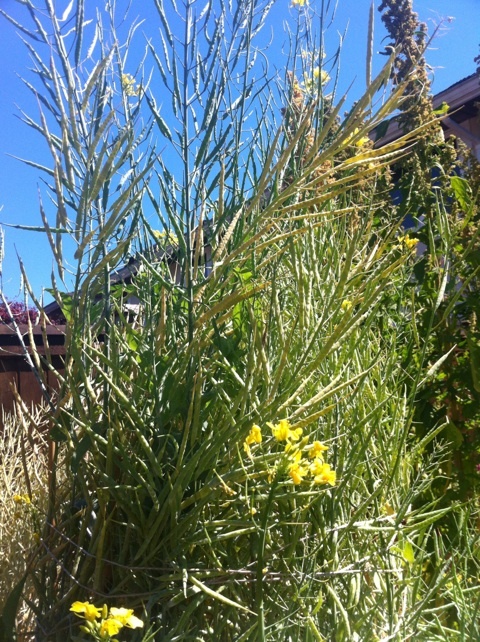 It saves seeds of plants that have grown well in a particular area and have a better chance of succeeding next year. It saves heirloom varieties as a living link to the past, as well as keeping a wider variety of food alive than the supermarket carries. It helps farmers maintain independence from agri-businesses like Monsanto with their patented seeds and terminator seeds. It can be a social experience, with seed exchanges and clubs in communities. In my community there has been an annual seed swap. 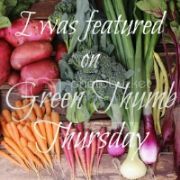 This can be a great way to connect with local growers and share tips and ideas. Leave a few plants to develop seed pods, or in the case of plants like tomatoes or squash, leave a few “fruit” on the plant to fully mature, well past the eating point, then harvest seeds at the end of the season. and more green pods lower down. It grew to over five feet tall! When the seed pods are dried (lighter in colour or going brown), collect the pods and spread the seeds out to dry further. If the seeds are very small, harvest them from the pods by rubbing and shaking them in a plastic bag, which should separate them from the pods. So far I've collected chive, cilantro and mustard seeds. They are dried and in envelopes now. Separate the seeds from the flesh, then soak seeds in warm water for a day to sort the good from bad seeds (good seeds sink) and to remove the protective coating on the seeds. Or place the seeds in a sieve and wash with a blast of water to remove all the pulp and coating on the seeds. Spread seeds on a mesh surface or cloth to dry. Store the seeds in an envelope and place in the freezer for a few days to kill off any viruses. They should be good for two to three years. Don’t be silly like me and forget to label the envelopes! Don’t save seeds from healthy plants that had late season problems. Just before my mustard seed pods were ready to be harvested many of my plants developed powdery white mildew. I was able to save some before it was too late, but I was so disappointed because I would have had two full envelopes of seeds to save. 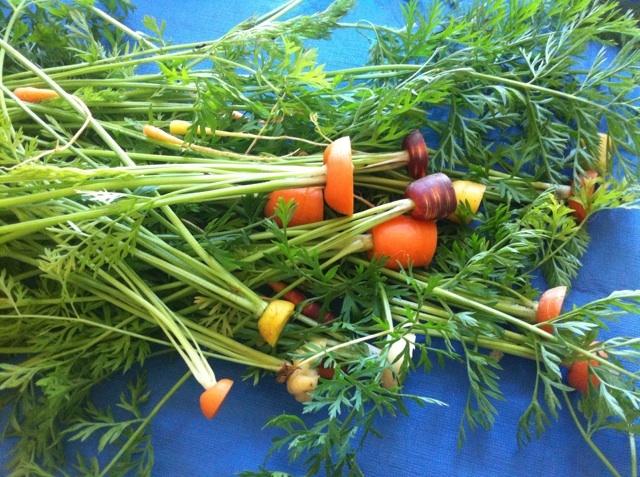 Pinterest: new carrots will not grow but hopefully they will flower and go to seed. The fun part of seed saving for me is to just leave the plant alone and watch it complete its life cycle. Just as it is fun to see what our food looks like when it is growing, I like seeing what happens to the plant after it is past it’s eating stage. The different seed and pod shapes and designs are fascinating. Wow. I always just get rid of my carrot tops without a second thought. I should definitely start hanging on to them if there's promise of flowers! I'll let you know how it goes! I've cut the majority of greens off half and left the greens on the other half. The half with reduced greens (which I planted several days before the others) have started regrowing new leafy parts so looking good! I just hope that there is enough sun strength left in the season to get to flowers. saving seeds completes the cycle of growing your own food. veggies like arugula, komatsuna, and other leafy veggies have beautiful flowers that are edible. the seeds are encased in a short, small pod, let them fully mature on the plant before cutting and then allow to finish dry in a cotton pillow case or brown paper bag. and as you mentioned do not forget to lable and date your seeds. Thanks for this post. More and more, I am either trying to save seeds or better yet, opting for the lazy gardener method of letting things reseed themselves. I've had luck with carrots, dill, parsley, beans and tomatoes by that method. The other lazy gardener seed saving involves composting. I have that to thank for most of my squash plants this year.